FOR 2018 CURRENTLY NO LONGER AVAILABLE: owners retired and are looking for new owners to take over in 2018. There's no better place to spend the evening than out on the harbour, watching the sun go down, no bugs to bother you, maybe a fishing rod in your hand.....you can picture it. If you can't imagine heading down to the cottage without going on the water this package is for you. Get the friends together, come down south and relax. Or maybe you need a romantic way to spend you anniversary or honeymoon. Captain Taylor will welcome his vacationing crew aboard the Brown Eyed Girl and take you up the harbour where you can enjoy the salt air, amazing views and good conversation. This package has everything you need for a harbour tour vacation. Good Times in the Maritimes! 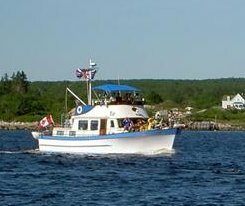 Harbour tour port is located in the Town of Shelburne. Tour hours are as follows: 9am, 2pm or 6pm. Tours are available June through September. Don't forget to dress for the tour: Evenings can be cooler than the day. Prices do not include taxes. Ask about group rates (more than six). Makes a good bachelor/bachelorette party too because the boat docks beside the town tavern for some post tour fun.